It may have taken me longer to find Mary Jane's Kitchen if not for a friend who learned of it through Korean television. He is a person who, for at least a decade, has steered me away from his favorite haunts so as to hog them all to himself. But, as many of his secret spots have drifted off to Restaurant Heaven -- even as he, an author and historian, volunteered to wait tables or wash dishes gratis, anything to help out -- has recognized the error of his ways, saying, "You have to tell people about this place because I want them to stay here." Well, it's not every day you see a man beg, so I was amused and curious as to what made this particular Korean hole-in-the-wall is such a standout. Another writer who's lived in Korea and is well-versed in its culture, is a fan of Mary Jane's and deems it authentic down to the way the women coddle him like a 5-year-old child or waeguk (foreigner), guiding him through every dish. I would have ribbed him about his "white devil" status, except at Mary Jane's they treated me the same way! You will likewise be greeted with plenty of instruction. Don't take offense. Family members running the restaurant simply want to do their part in educating people about this cuisine because 1) they're proud of their heritage, and 2) they believe in spreading the word about healthy living. Matriarch Jane Shin and her daughters Mary, Ellen and Kellie, initially cooked for Seventh-Day Adventist church functions, cooking for 50 to 100 people at a time, and this led them to expand their outreach to the general public. With a pharmacist father who raised his daughters with an understanding of Western and Asian medicine, Mary said she and her sisters are "products of our priorities and lifestyle." She said the restaurant was "not an entity created to make money," but to help those interested in health and nutrition beyond the frenzy of fad diets and extreme weight-loss programs. Mary Jane's uses no MSG or processed sugar, utilizing fruit sugars when sweetness is needed. Dishes do not lack for flavor, although some, like a kal kook soup ($7) of handmade noodles made from shizo seed, could use a chili-sauce assist for those whose palates have little experience, beyond white rice, to food so plain. But there are plenty other full-flavored dishes leading up to graduation to spare fare. At Mary Jane's Kitchen, an abundance of side dishes are served with their Korean entrees. 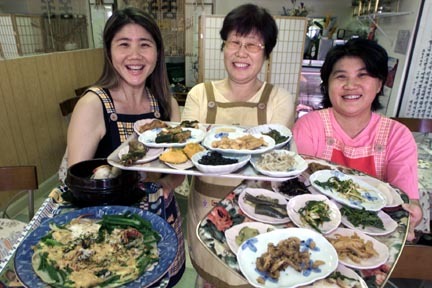 Kellie Shin, left; her mother, Jane Shin, center; and sister Ellen Shin show off the variety. THE WOMEN of Mary Jane's are extremely attentive, and royal treatment begins with panchan, the presentation of multiple complimentary side dishes. In fact, contrary to Western-style dining, the measure of a Korean meal is not in an elaborate or meaty entree, but in the diversity and quality of the side dishes. And it's not every day that one sees this many, 18 of them proffered, each representing a different form of nutrition, whether it's calcium from dried fish and shrimp, the iron content of Korean ogo and slivers of black nori dotted with sesame seeds, or the anti-bacterial, cholesterol-fighting properties of pickled garlic. With the mix of ingredients comes a mix of flavors from bitter to sweet, and textures. Before I knew it, I had a piece of kimchee'd tripe in my mouth. Chewy was not what I was expecting. It was great, but I sure wish it had been a piece of turnip instead. When Mary said they aren't out to make money, I believe them. With all the panchan, a couple already in the practice of healthy, small portion-oriented dining can easily get by on a single $12 stew. Portions are large, and if curiosity gets the better of you and you start over-ordering, they'll try to stop you. Start with the dol sot bi bim bab ($10), or stone pot rice in which the rice touching the bowl is cooked to a crisp. As we stared at its mix of egg, nori, potato greens, carrots and other greens, the reverie was broken by a voice exclaiming, "You have to stir it, mix it up!" It was Ellen, who then took matters into her own hands, mixing the crisped rice with the softer ingredients so no part would be too chewy or too mushy. To simplify ordering, the menu lists the most popular items from top to bottom by category. So you know the skate wing (stingray) stew ($12) is the most popular fish dish, ranking above the butterfish stew ($12), and kalbi is the most popular of the meat and poultry category. Having gotten the health talk, I felt a little guilty about ordering the shortribs, which were difficult to attack armed with nothing but silver chopsticks. I had laughed at my friend trying to gnaw off a piece of the shortribs, the chain of meat and bone dangling from his mouth. He had his turn to laugh when I did the same. "Just pick it up with your hands," Ellen said. "We do that all the time, just grab." "Do you have a knife instead?" I asked. As she delivered knife and fork, I felt like the ultimate waeguk. But I'm learning. You can't help but find a meal and enlightenment at Mary Jane's Kitchen. Cost: About $18 to $25 for lunch or dinner; B.Y.O.B.